In a difficult-to-access region of Taiwan’s Yushan National Park, Professor Hwang Mei-hsiu undertakes research into the obscure and endangered Formosan Black Bear. Accompanied by indigenous ranger Lin Yuan-yuan, Professor Hwang tracks, tags and studies this remarkable animal that is under pressure from encroaching civilization and poaching. Six years in the making, Lee Hsiang-hsiu’s documentary Black Bear Forest is a tremendous work of film-making. Smart, personable and emotionally effective, it starts with a simple subject matter – researching endangered bears – and expands into several different directions. The end result is a film that is in turns educational, fascinating and emotionally rewarding. For fans of documentary film-making, and particularly nature documentary, this is an absolute must-see. The film’s initial focus in indeed on the bears, which are both reclusive and gorgeous, but early into the film that focus gets an unexpected expansion into the indigenous people of the Bunun mountain range. Lin, the tracker who helps Hwang’s expeditions into the forest, follows traditional beliefs and customs, and this adds an entirely new layer to the repeated ventures to Dafen. That Taiwan is home to numerous indigenous nations and peoples often comes as a surprise to anyone unfamiliar with the country, and through Lin the film provides an insightful showcase into their relationship with the land and their history. The film’s focus on the bears also expands into the ecosystem of which they are an integral part. The narrative is peppered with beautiful montages of Dafen wildlife, including wild boars, squirrels, birds and deer. Judiciously used aerial footage gives a brilliant sense of scale. The mist-covered mountains, winding streams and precarious shale cliffs offer the viewer some beautiful scenery. Dafen is particularly inaccessible – three days in via uneven and risky terrain – so for the overwhelming majority of us this is our best chance of ever seeing it. The film is shot in a straight-forward and accessible manner, combining handheld footage on the trail with Hwang’s own research recordings of earlier expeditions and trapped bears. For flashbacks, in which Hwang or Lin reflect on past experiences or events, limited animation is used to bring their stories to life. It is sparingly used, but quite effective. At the centre of the film there is a personal story: the years-long friendship between Hwang and Lin. She is an American-educated and intellectual scientist, while he is a gruff, middle-aged and patriarchal man with a strong spiritual connection to what she views as scientific research. It feels as if their friendship is one that has formed against the odds, and yet they clearly have a huge connection through mutual interest: their love and concern for the black bears of Dafen. 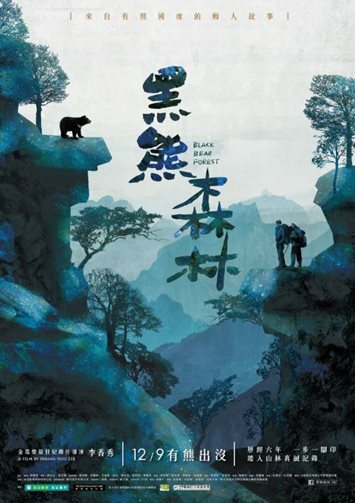 It is remarkable that Lee Hsiang-hsiu took six years to produce Black Bear Forest, making countless trips into the wild both to film Hsang and Lin and to capture the wonderful animals and trees that populate that region. The end result, however, is truly worth it. This is an intelligent, gentle and very human documentary, and comes with my highest possible recommendation. Black Bear Forest is screening at Sydney’s Taiwan Film Festival on Saturday 28 July 2018. Book tickets at Event Cinemas here.